Leaflets giving full details of each walk listed below are available in pdf format by clicking the links provided below. Alternatively copies are available from the Guildhall - a voluntary donation to the Mayor's Charity Fund is suggested. Walkers should take due care when following these walks and do so at their own risk. No liability is accepted by Saltash Town Council. All maps Crown Copyright and database right 2011. All rights reserved. 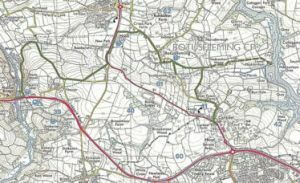 Ordnance Survey Licence Number 100051032. 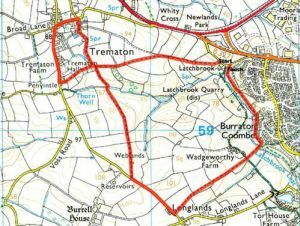 Details: Circular walk from Latchbrook Cottages, mainly over fields, via the restored ancient Trematon Animal Pound, then past Trematon Hall, through Penvintle Farmyard, to Longlands, then Wadgeworthy farm and return to Latchbrook Cottages. Details: Part circular – Starting at St. Stephen’s Church, or Cecil Arms: this walk takes in footpaths and Cornish lanes through meadows, woodland and alongside creek and estuary; via Forder, Shillingham, Wivelscombe, Elm Gate, Wivelscombe, Shillingham, Antony Passage, Forder and return to St Stephen’s Church / Cecil Arms. Details: A walk along lanes, green lanes and field paths through meadows and woods with pleasant river views. Start and Finish at Latchbrook Cottages: via Wadgeworthy Farm, Longlands, Broadmoor, Trevollard, Bagmill Farm & Barn, Cumble Tor Farm, Trematon and back to Latchbrook. Sections of this walk can be extremely wet and muddy: especially the Cumble Tor Farm end of the lane from Bagmill. 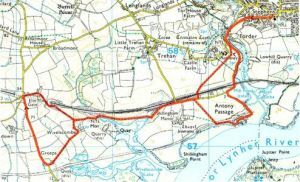 Length of route: 6 km (3.8 miles) – a further 1.95 km (1.2 miles) if the walk to Moditonham Quay is included – a further 3.2km (2 miles) if walking back to Carkeel from Notter Bridge; and 2.75 km (1.7 miles), each way, if walking between Saltash Town Centre and Carkeel. Details: This walk follows the Northern section of Saltash Boundary via Carkeel, (Moditonham Quay) and Botus Fleming to Notter Bridge. 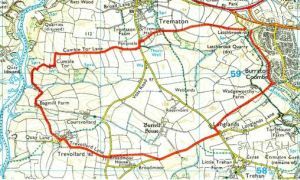 Length of route: 5.25km (3.3 miles) Details: Start and finish at Latchbrook Cottages - very muddy going in places. 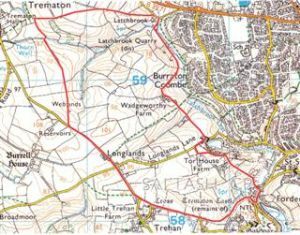 Route is via Wadgeworthy, Meadowsweet Quarry, Tor House, Forder, the rear of Trematon Castle, Castle, Farm, Trehan, Longlands and Trematon. 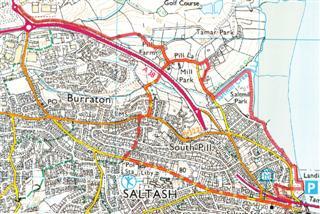 Details: From Saltash Fore Street via Jubilee Green, Saltmill and Pill to Avery Way (near Waitrose supermarket).